Oh my goodness, people! I think I've just had my best moment ever. 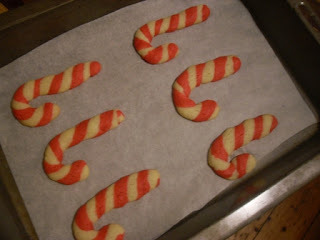 Up to now I thought my best moment was my Hot Cross Bunnies with Chocolate in the Tummies, but these Candy Cane Cookies kick those cute bunnies' sugary little behinds. I wish I was a better photographer, because honestly, the photos don't do them justice. They are not the weird orange colour you see, which is what happens if you try and take photos in the middle of the night. I promise, these cookies are beyond adorable. Again, they are the result of a few problems, which seems to happen a lot around here lately. I had a recipe for candy cane cookies with a cookie press, but as I don't have a cookies press, and never got around to getting one, I had to come up with a Plan B. Another recipe I've seen had two little ropes of dough twisted together, bent into a candy cane shape, and flavoured with cinnamon sugar. 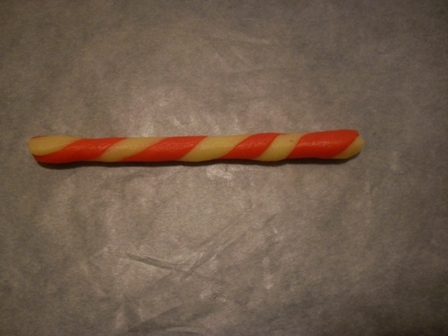 Which sounds nice, but I wondered about making it look more like a proper candy cane. And then I thought how nice it will be if I use red and vanilla dough, but after twisting them together I'd roll them just enough to blend the colours, so that it looks like one piece of dough. Now isn't that the cleverest thing you've heard all day? To be honest, I do realise there's nothing new under the sun, and I'm sure if I Google Candy Cane Cookies there will be around 6 million people who have been there, done that. But I'm not going to do that. I'm going to pretend I'm the first person in the universe to come up with these gorgeous little things, and make myself a cup of tea to have with one of my cute cookies to celebrate. And they taste good too. I've decided to make life easy for myself and use the same recipe as for the Chocolate Coffee Crumble Cookies. It's easy to make and doesn't use 500 different ingredients you've never heard of before. I know it is better to colour dough with food paste colouring, but I only had the liquid stuff, and it worked fine. 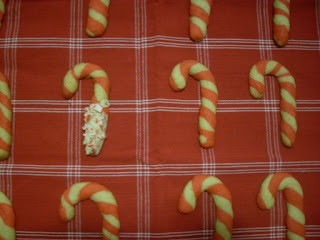 I've also dressed up one of the cookies in white chocolate and little bits of crushed peppermint candy cane. I was only going to do the one to show you good people, but after eating it, I'm considering giving all of them the special treatment. Normally I don't really like peppermint, but here it is a nice contrast with the buttery cookie. Plus there's the white chocolate. Anything surely is better with white chocolate. So it is with pride that I bring you Candy Cane Chrismas Cookies. Please humour me and pretend you've never seen anything like it before. Thank you very much. Beat butter in your mixer for 30 seconds. Beat in sugar, baking powder, and a pinch of salt. Beat in egg and vanilla. Beat in as much of the flour as you can with the mixer, and stir in the remaining flour by hand. Divide the dough in two, and colour one half with red food colouring (I needed 5ml). Divide each dough portion in half. Cover and chill for an hour, or until easy to handle. 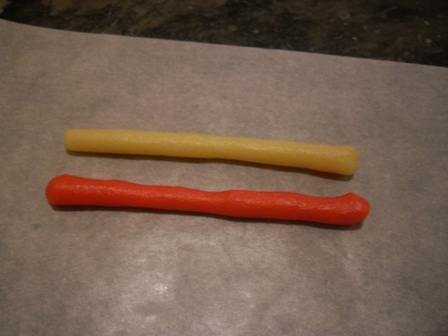 Work with only about half a cup of dough of each colour at a time, and keep the rest in the fridge until needed. Pinch of a piece of dough the size of a small marble from each colour. I know this doesn't seem like much, but I promise you it's enough. Roll each bit out until it is about 10cm long and about 5mm thick. If one piece is a lot longer than the other one, trim it a bit. This isn't an exact science. You'll get the swing of it after making a few. Twist the two pieces together to form a rope. 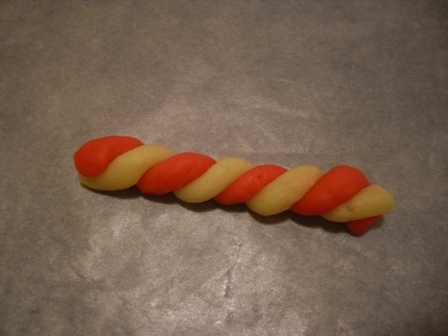 Try to make the coils as tight as possible without breaking the dough. Lightly roll the rope until the colours just blend together, about the size of a pencil. You can twist it again a few times to increase the number of swirls. 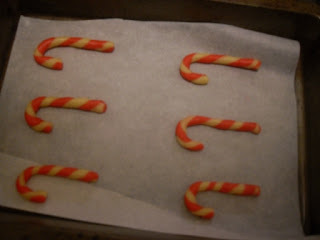 Put on a baking sheet, and bend into a candy cane shape. Bake for 6-8min, or until slightly brown around the edges. Let the cookies cool on the baking sheet for about 5min, then transfer to a wire rack to cool completely. 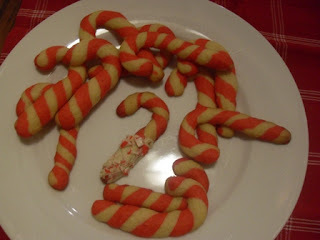 If you want to decorate the cookies further, you can dip the bottom halves in melted white chocolate, and sprinkle with some crushed peppermint candy cane. Leave on some baking paper to set.